The refurbished WaterWorks aqua park. 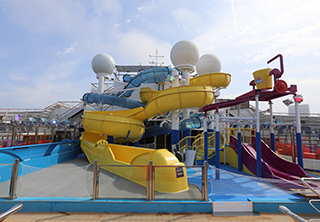 Carnival Cruise Line’s Conquest-class ship Freedom has undergone a multi-million-dollar renovation, bringing onboard enhancements like an expansive new WaterWorks aqua park, enhanced dining options such as a re-branded Deli and Bonsai Sushi Express, expanded retail spaces, a new miniature golf course and more. The upgrades are part of the $2 billion ship enhancement program that has also added popular Fun Ship 2.0 innovations across the fleet. These complement an array of other on-board drink and culinary experiences, as well as family-friendly options that include the Seuss at Sea area for kids. Following the three-week dry dock in The Bahamas, Carnival Freedom resumed its year-round schedule of six- and seven-day Caribbean cruises from Galveston that visit destinations in Jamaica, Mexico, Belize and Grand Cayman.